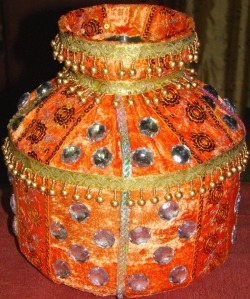 Ghadoli is a metal pot decorated in such ethnic & traditional form. it is available in many colors such as red, maroon, golden etc. The exclusive ghadoli with Jari cloth, lights, Multi-coloured lights etc. are also available.